This repair kit supplies the capacitors needed to repair the power supply board inside a LG L196WTQ-BF, LCD Monitor. This repair kit is for the power supply board pictured above. 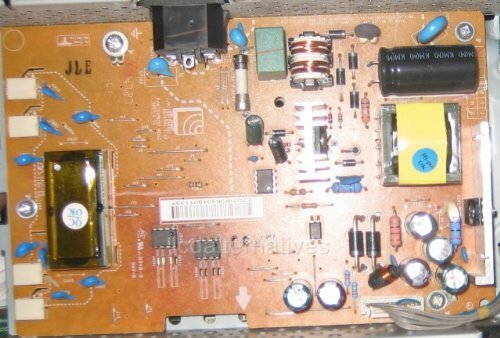 Please verify that the power supply board inside your LCD monitor or TV matches this power supply board before ordering! This LG L196WTQ-BF, LCD Monitor repair kit contains 8 capacitors needed to repair the power supply board inside your LG L196WTQ-BF, LCD Monitor. This kit does not include the large 400-450v capacitor, that capacitor may be purchased separately. If we don't have a kit for your LCD monitor or TV, we will gladly assemble one. This repair kit contains 8 Electrolytic capacitors. We only use Panasonic, Nichicon, or Rubycon capacitors. If you have any questions about this product by LCDalternatives, contact us by completing and submitting the form below. If you are looking for a specif part number, please include it with your message.